Starring: Johnny Depp, Mia Wasikowska, Helena Bonham Carter, Crispin Glover, Anne Hathaway, Matt Lucas, Tim Piggot-Smith, Frances de la Tour, Geraldine James. Voices: Michael Sheen, Stephen Fry, Alan Rickman, Barbara Windsor, Paul Whitehouse, Timothy Spall, Christopher Lee, Imelda Staunton, Michael Gough, Frank Welker. Lewis Carroll’s classic tale “Alice in Wonderland” has been covered time and time again throughout the years but is there anyone more suited to a version than gothic visionary director Tim Burton? Years after her adventures in Wonderland have become a dimly remembered dream, 19-year-old Alice (Mia Wasikowska) takes a tumble into eerily familiar ‘Underland’, a realm of terror under the mad Red Queen (Helena Bonham Carter), who has usurped the White Queen (Anne Hathaway). Disappointed she’s forgotten them, the Mad Hatter (Johnny Depp) and friends insist Alice is their prophesied champion returned and that she’s back to end the Red Queen’s reign of terror. Followers and avid fans of Lewis Carroll may not be happy with Tim Burton’s adjustment to the story. He has tweaked a few things, mainly changing Wonderland to Underland and making Alice older. They may seem like unnecessary changes but it’s allowed in adaptations and that’s exactly what this is, an adaptation. Not a complete transfer from page to screen. That being said, I still loved it. Burton can be a bit hit and miss of late but there’s no denying the splendid vision and imagination he has brought to this classic children’s adventure tale. Yes, it’s laden with CGI but it looks absolutely wonderful and everyone in it is perfectly cast. 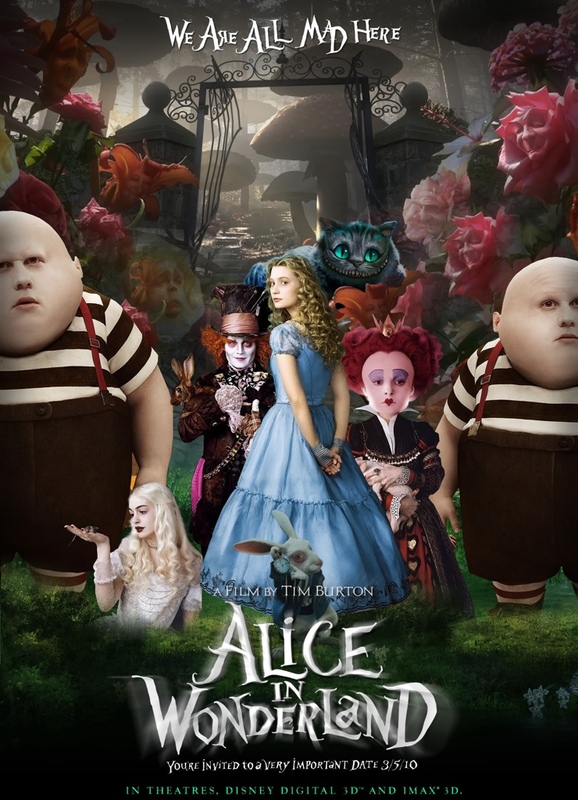 I normally can’t stand Bonham Carter but she is excellent as the tyrannical Red Queen with her shrunken body and bulbous head and Depp makes a very fine flame-haired, schizophrenic Hatter with convincing Scottish brogue, as well as a fine voice cast and a more than competent Wasikowska as the older Alice. To upset fans further though, Lewis Carroll’s word play, language and riddles are omitted but if you accept it as Burton’s variation then there is lots to be enjoyed. An exciting, visually splendid undertaking from the (7th) Burton/Depp partnership. Pure fantastical escapism. This entry was posted on January 27, 2012 at 12:16 am and is filed under Adventure, Family, Fantasy with tags 2010. You can follow any responses to this entry through the RSS 2.0 feed. You can leave a response, or trackback from your own site.